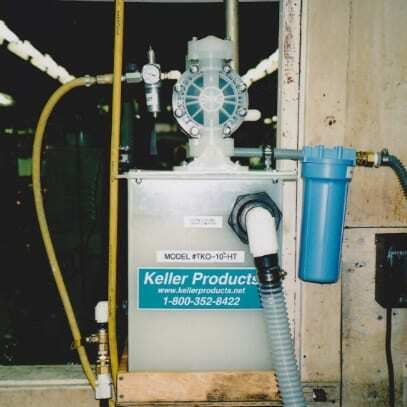 Keller Pump/Separator Units separate suspended oil from a hot parts-washer water and return the cleaned water to the feed tank at a high flow rate-180 gal/hr. Units may be operated continuously at 160°F, and intermittently up to 180°F. The units are supplied with inlet devices which draw oily water from the tank surface. The self-priming air-operated diaphragm pumps have a suction lift of 10 feet and may be dead-ended or run dry without damage. The oil separator elements are permanent and are never replaced. A filter protects the pump and oil separator section. 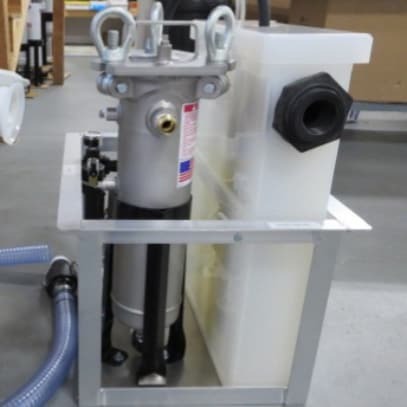 The Model #385 has a stainless steel bag filter for heavy solids loading, while the TKO-10HT has a cartridge filter with replaceable filter element for light solids loading. The compact units are shipped by UPS ready to operate. To run, simply place next to the wash tank and connect a 1/4″ compressed air line, no electricals and no new piping required. Oily water is pumped from the surface of the tank through a fixed inlet device #555-08 or (optional) floating inlet device #555-09, through the prefilter, and then to the Keller permanent plastic separator elements (U.S. Patent #5,401,404) immersed in a 10 gallon plastic tank. The separator elements cause the suspended oil drops to form a continuous layer that rises to the top of the 10 gallon separator tank. The cleaned water returns to the feed tank via an overflow port. 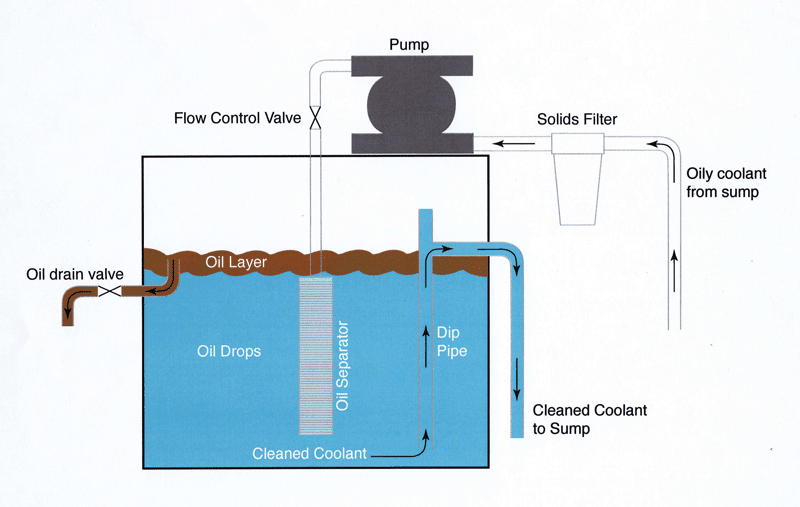 The oil collected in the separator tank can be drained into a waste oil container by opening the oil drain valve occasionally. 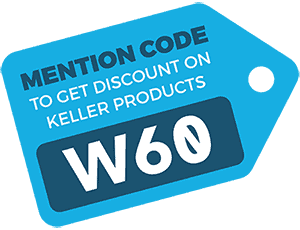 To clean the Keller patented coalescing pack, simply unthread the disk pack from the coupling and wash. Then re-assemble.